CONTEMPORARY LANDSCAPE PROJECTS CRITIQUE – Master in Landscape Architecture Barcelona – Universitat Politècnica de Catalunya – 35ª EDITION. Contemporary Landscape Projects Critique pursues to explore the mechanisms of analysis, research and critical reflection on contemporary landscape projects. In recent times, it is common that Landscape Architecture theory has been searched through the work of particular authors. The task of comprehending projects, of getting the scope of the proposals, of the contemporary style of certain landscape trends will be the theoretical foundation on which discussion and reflection will grow. The huge archive of projects summited throughout 20 years of International Biennial of Landscape Architecture of Barcelona will be the practical ground from which the seminar will nurture. Some groups already working on the theoretical reflection, such as Landscape Architecture Europe – LAE, which articulate the transfer of knowledge, will help to lead this theoretical seminar that addresses research and critical evolution of the discipline. Critique is an important means of reflection on the products of creative processes, it trains the ability of critical thinking and transparent communication. In this course, students will be asked to choose a contemporary landscape project and write an illustrated project critique. On the basis of literature studies, lectures, field studies, drawing and writing exercises, they learn to construct a coherent and well-founded critique. Critique writing will inspire them to challenge our their opinions, to explore what is meant by a design, to explain how it should be understood, to propose potential comparisons, to show by what criteria it could be evaluated and to indicate the larger lessons one can take from this evaluation. 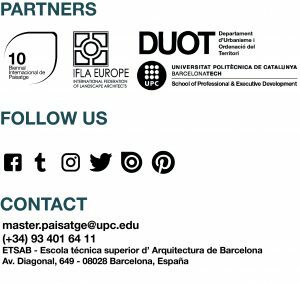 – Reflect on Landscape Project designing mechanisms, studying projects form the Biennial of Landscape Architecture of Barcelona and Landscape Architecture Europe (LAE) books. – Apply analysis methodologies in contemporary landscape projects. – Design a theoretical proposal concerning to new landscape tendencies. – Recognize current and future advanced tendencies of Landscape Architecture.